A good place to camp? Hey, I was wondering if you guys could put up a post that could help me find camping spots in the area (adirondacks, catskills, western mass and vt) for a group of adults without kids. It seems like every place caters to families. Got a suggestion for Dan? Please share! My friends and I really enjoy Rogers Rock. There are kids but it by far doesn't ruin our time. Went there as a kid and loved the area. Went there as an adult with friends and loved it even more. 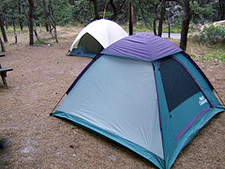 Most is in the placement of your campground. look for the farthest out from the enterance, even some water front sites and it's better for adults. Kids will usually be around but there are no water or theme parks around so it's limited in whole squadrens of children taking over. Canoe & rowboat rentals, cute country store. Sucker Brook Trail for hiking, and the Adirondack Museum is a short drive away. Forked Lake Campsite in the ADKs. I camped there in summer of 07 and our site was actually most easily accessible by canoe (that mostly eliminates the chance of being near families with kids) although there was a walking trail to it . It's nearby some beautiful day-hikes at Buttermilk falls and Goodnow mountain (for example). Not real sure what you mean by campgrounds for adults, but my husband and I camped at Woodford State Park in VT last year and had a great time. It's very near Bennington, so from Troy it took us less than an hour to get there. There's a small lake right on the property with boat rentals, and some small hiking trails, with the Greens not too far away. In general state park campgrounds have fewer amenities and might not be as "family friendly" with kids programs and such, so that might appeal to you. Have fun! Are you looking for the ability to be loud or the adult need for quiet? Fish Creek is accommodating for loud, though there are families and family programming. Round Lake is a quieter lake with no motor boats allowed; there are still families, but it caters to a more low key crowd. Upper Schroon is also on the quieter side. If you're able to do a longer trek, head up to Baxter Park in Maine. It's a carry in/carry out park with great trails. There is a funky little on the shore campground (it is a bit of a Saratoga County Park land) about 4-5 miles north of the Batcherville Bridge on North Shore Rd on the Great Sacandaga Lake. Crossroad: Co Rd 4 and Sand Creek Rd. I go there for springwater and rarely see kids. Places that don't cater to families seem to cater to college kids. If your idea of camping is building an enormous fire with lighter fluid and getting rip-roaring drunk... well, you don't need to go camping for that. Ha ha. Big fan of backpacking in the Catskills. Can't remember the name of it now, but there's a lake in the Catskills that you can camp near. Far enough in that it tends to weed out the troublemakers. Camping around Lee MA hasn't been bad. It's nice to be able to go into all the little towns and eat good food. Great timing, I have camping fever and would love some ideas for new places to go.. I like North South Lake and Kenneth Wilson State Park in the Catskills. The northern Adirondack's (around Saranac and Lake Placid) is my favorite spot to go. Many campgrounds promote their family activities but are just as good for non-kid groups (and if you get a site away from the main rec areas). Every place caters to families? I assume that means you want to party into the wee-hours of the night with your Bon Jovi blasting on your boom box? Every private and public campground I have ever been to has quiet hours. Perhaps you need to define "adult" camping. Both are reservable through the ReserveAmerica.com system. Every campground is different, and I don't know quite what Dan is looking for in terms of not catering to families, but through those sites you can see the amenities available. State campgrounds tend to be a bit more bare-bones than the commercial sites, and may be more to his liking. In VT and MA, start by looking at the National Parks Service sites. Emerald Lake State Park in East Dorset, Vt., about 10 minutes north of Manchester on Route 7. Quiet, private and it's in Vermont, so there's a live-and-let-live vibe. My all time favorite campground is Kring Point, which is up in the Thousand Islands. Lots of sites on the water, some are tent-only sites. Usually not many kids, and I find it nice and quiet at night. In general, I find Vermont campgrounds much more accommodating. Sorry, New York. If you have a tent, you can get a lean-to site in Vermont for nearly the same price as an empty site. That lean-to makes all the difference in a storm. Very far out of your way, but the only campground I know that actually separates campers by type (familes, couples w/o kids, and groups) is Paine's Campground way out on Cape Cod. In my Yelp review, I called it "something of a tenters' paradise." your Bon Jovi blasting? I think the OP was asking about camping for adults, not camping in the 80's. I have this book I picked up a couple of years ago, "The Best in Tent Camping NY State: a Guide for Car Campers Who Hate RVs, Concrete Slabs, and Loud Portable Stereos." It gives a lengthy description of each recommended campground, including which loops and sites are best for being away from it all, as well as the overall feel of each place. The book covers the whole state, although the Adirondack section is longest. Forked Lake, as recommended above by Allie, is the #1 campground in the state according to this book. Follensby clear pond and the Fish creek pond watershed area in general make for some great secluded camping. Free state land camping on small ponds with no fee. no motorboats and lots of great portages and canoeing. On Follensby there are several islands to camp and lots of great fishing. If you are looking for site-camping Fish Creek has some pay for sites with outhouses, but much of the are is without ameneties. Thanks for the comments everyone! I'm not looking for a place to party, what I am looking for is a place where a few friends and myself can get out of Albany for Tulipfest (we live in the neighborhood and are getting a bit sick of dealing with the disaster that ensues during Albany's street festivals), enjoy some hiking, and nature-seeking without tripping over kids. Oh, so you weren't talking about naked camping? Fish Creek Pond is one of the most beautiful campgrounds we've been to. Each site is waterfront and you can rent canoes to be delivered (and picked up) to your site and paddle through the series of lakes and ponds. Moreau Lake is nice as well; the site are quite large and allow for you to spread out and not bother too many people; or, vice versa. Great hiking trails too. Au Sable Campground on Lake Champlain is a good place too; you're just a hop-skip-and a jump away from the ferry to Burlington if you're camping for a long weekend and want to stretch your legs a bit. Check out reserveamerica.com for others... you can browse by map to find a great location! Thompson's Lake campground will most likely be the closest post Tulipfest - about 30 minutes from downtown Albany. The places recommended by @Leah, @Jessica, and @Seth all have tons of mud, mosquitoes, aggressive bears, quicksand, and escaped convicts. Additionally, they are widely recognized as being haunted by angry Algonquin spirits. I'll second Rogers Rock. They have some sites on islands in Lake George. Very nice. Also, Crown Point Campground on Lake Champlain have a nice laid back feel for some adults to camp and hangout. There is an old ferry pier that you can fish off of. It is also across the road from the Crown Point State Historic Site--a neat place to check out. Not sure if the bridge construction is loud or disturbing to the camping area.